Model simulations conducted under ArcRisk suggest that climate change will affect contaminant pathways and levels in the Arctic and elsewhere. Models are useful and continue to be improved, but further improvements are needed. Environmental contaminants are emitted un-/intentionally. Pesticides are a classic example of intentional release of a toxic chemical to the environment. Other chemicals are released unintentionally to the environment e.g. by-products from industries. Furthermore, contamination from historical use may still be a source of emissions, e.g. via contaminated sediments and land. The further fate of the contaminant depends both on properties of the substance and to which media the emissions took place. Some chemicals are long-lived as they persist degradation. Such chemicals can be transported long distances in air and water, accumulate in food webs and pollute areas and animals far from the original source. Transport of POPs can be illustrated by “global fractionation”. They evaporate from the source – e.g. pesticides used in a southern agriculture. The pesticides are then transported with air further north (in the northern hemisphere), precipitate/scavenges out from the air. Eventually, the POPs repeat this process in several steps (“grasshopping”) until they reach the Arctic (Wania and Mackay 1996). Emissions of legacy POPs such as DDTs, PCBs and HCHs have decreased during the last decades due to extensive regulatory action, including complete ban in several countries. Metal emissions, such as mercury, are also expected to decrease. However, Pacyna et al. (2010) estimated an increase of Asian mercury emissions unless emission controls will be implemented. This is of high importance in a global perspective, since the emissions in Asia are estimated to be higher than any of the other continents. If emissions will continue to increase largely depend on economic development and advances in industrial techniques and emission control techniques. For the metals and unintentionally formed POPs, such as the dioxins, a complete ban is not possible as the contaminants are naturally occurring and unintentionally generated in processes not aiming to emit these contaminants. As permafrost thaws in the Arctic, waste sites may leak contaminants to the receiving water systems. Less ice cover in Arctic facilitates shipping and off shore activities in a vulnerable area, where sea charts and search & rescue systems not always are well developed/within acceptable reach. These factors need to be taken into account for future work with contaminant risks in the Arctic, especially environmental pollutants related to transport, oil and gas. The North West and North East passage have already been used for shipping traffic. Shipping and offshore in the Arctic was one of the themes at the Arctic Frontiers 2014 conference in Tromsø, Norway. POPs and mercury reach the Arctic mainly via atmospheric long range transport. Some substances are also transported via ocean currents and rivers. DDT and PCB are examples of atmospheric transported compounds, while α-HCH can also be transported by water currents. Atmospheric transport of semivolatile POPs to the Arctic takes place via repeated evaporation and deposition events, resulting in the pollutant “hopping” to its final destination in the Arctic (Wania and Mackay 1996). Mercury is also transported from lower latitudes to the Arctic via the atmosphere. The transport mechanism involves different forms of mercury, both gaseous elemental mercury (Hg(0)), Hg(II) and particle bound species, and involve an oxidation process. This is further described in the report by Kallenborn et al (2011). The most relevant climate parameters for the fate and transport of POPs are temperature, precipitation, sea- and land-ice cover, soil erosion, and the global circulation of the atmosphere and the oceans. When considering how climate change will influence the emissions, transport, and fate of contaminants, a distinction must be made between primary and secondary emissions. For ‘emerging POPs’ and DDT, which are still in (restricted) use, any changes of primary emissions will be a result of changed human behaviour (e.g. by legislation). Secondary emissions are re-distribution, e.g. emissions from contaminated sediments, meltwater runoff and local waste sites. These sources will become more important for the legacy POPs, which are not in use anymore. To further explore how climate variability and global climate change affects the routes and mechanisms by which pollutants are delivered to the Arctic, a suite of models have been applied (including multimedia models and single-media atmospheric and oceanic transport models). These processes were poorly understood, and effort was devoted to investigate the transport and fate processes of pollutants under the current climate as well as under changing climate conditions. See the section on modelling for further descriptions of the models and system borders. 1) Strength of secondary re-volatilization sources: Increased re-volatilisation from soils, surface water, snow. 2) Atmospheric circulation patterns: Changed wind patterns will affect the transportation of POPs. 3) Precipitation: Affect deposition and re-volatilisation of POPs. 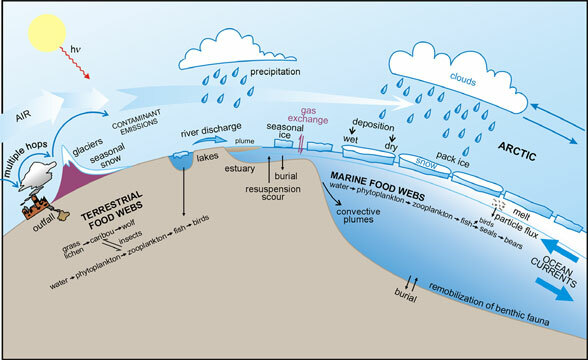 4) Changes in ocean currents: Impact the transportation pattern of more water-soluble compounds. 5) Melting of sea ice and mountain glaciers: Evaporation/deposition of POPs from/in open sea, mobilisation of POPs from glaciers. 6) Frequency of extreme events: Affect redistribution from secondary sources. 8) Partitioning: Higher/lower fractions of POPs present in different matrices, e.g. soil, air, particles. 9) Biotic transport: Changed migration patterns/invading species can alter the food web structure and POP distribution. The fate of POPs in the Arctic Ocean is affected by variations of sea-ice cover and the vertical stratification of water masses. Precipitation, snow transported with sea ice, and sea ice itself are transport media for contaminants within the Arctic. Less sea-ice export out of the Arctic means that contaminants stored in sea-ice will be released into the Arctic Ocean instead of being exported further south with the ice into the North Atlantic. When the ice edge retreats further North, ice melting will take place in new areas of the Arctic Ocean, where the contaminant concentrations in the surface water might increase.